Q*bert is an arcade video game developed and published by Gottlieb in 1982. It is a Isometric platform game that features two-dimensional (2D) graphics. The object is to change the color of every cube in a pyramid by making the on-screen character jump on top of the cube while avoiding obstacles and enemies. Players use a joystick to control the character. Developed during the period when Columbia Pictures owned Gottlieb, the rights to Q*bert stayed with Columbia even after they divested themselves of Gottlieb's assets in 1984 and therefore, is currently a property of Sony Pictures Entertainment who acquired Columbia in 1989. In 2012's Wreck-It Ralph, Q*bert's appearance is credited to "Columbia Pictures Industries, Inc."
Q*bert is an isometric platform game with puzzle elements where the player controls the titular protagonist from a third-person perspective. 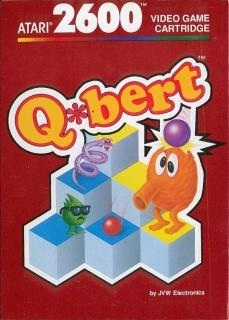 Q*bert starts each game at the top of an isometric pyramid of cubes, and moves by jumping diagonally from cube to cube. Landing on a cube causes it to change color, and changing every cube to the target color allows the player to progress to the next stage. In later stages, each cube must be hit multiple times to reach the target color. In addition, cubes will change color every time Q*bert lands on them, instead of remaining on the target color once they reach it. Jumping off the pyramid results in the character's death.